The Pine Valley Chapel is located in Pine Valley, Utah, about a 45-minute drive north from St. George, Utah. This historic meetinghouse of The Church of Jesus Christ of Latter-day Saints was built by settlers of the valley in 1873. Latter-day Saints in the area continue to meet in the building each week for worship services. During the summer, tours of the building are given daily. These tours highlight the dedication of the early Saints in Pine Valley and the construction and ornamentation techniques they used during the building’s construction. The tours also include a visit to the nearby tithing office, which was constructed in 1886. In the chapel, only the first floor is accessible for visitors in wheelchairs. For information about visiting the Pine Valley Chapel, click or tap here. Settlers came to Pine Valley in 1856 to harvest timber. The construction and operation of successful lumber mills brought additional settlers. 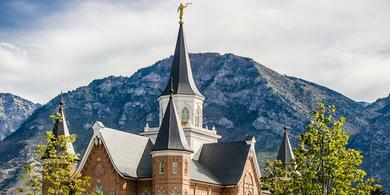 The mills provided timber for several Latter-day Saint construction projects, including the St. George Temple, the St. George Tabernacle, and the pipes for the organ in the Salt Lake Tabernacle. Settlers began using local resources to build a chapel in 1872. They finished after a year of hard work. Local settler and shipbuilder Ebenezer Bryce is often credited with designing the chapel’s roof using shipbuilding techniques. Although Bryce may have assisted with the construction of the chapel, the roof was constructed using normal building methods of the time. The first floor was often used as a community center and schoolroom. The second floor functioned as the primary worship space. Prominent leaders, including Wilford Woodruff, visited the area and probably gave sermons in the chapel. The two-story building has undergone several renovations and restorations, but the original structure remains. The roof and windows have been replaced, and other modern conveniences have been added. An attic room added after the building’s completion now contains historical artifacts, including photographs of local Church leaders since the early days of the settlement. The chapel and tithing office were added to the National Register of Historic Places in 1971. The chapel was dedicated in 2005 by Elder Jeffrey R. Holland, who has ancestors from Pine Valley. For information on other Church-related historic locations in southern Utah, click or tap here. The Paris Tabernacle, located in Paris, Idaho, is a historic meetinghouse of The Church of Jesus Christ of Latter-day Saints. 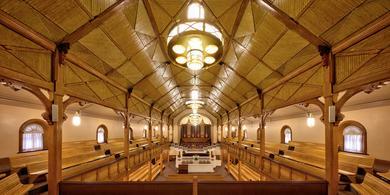 Since its completion in 1889, it has functioned as a house of worship and a community center. Today it is also open for public tours. Guided tours, about 30 minutes long, highlight the faith and sacrifice of early Church members who donated their time, labor, and money to build the tabernacle. The main floor is accessible to visitors in wheelchairs. Public restrooms are available. 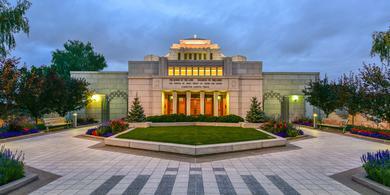 For information about visiting the Paris Tabernacle, click or tap here. Settlers established Paris in the late 1860s and soon needed a meetinghouse where they could gather to worship God. Although plans were created right away, work on the tabernacle did not begin in earnest for more than 20 years. Laborers and resources were needed to complete other buildings first, such as the Logan Tabernacle and the Salt Lake Temple. In 1884 construction began on the Paris Tabernacle, using a new set of plans designed by Joseph Don Carlos Young, who was a professionally trained engineer and a son of Brigham Young. Local Latter-day Saints quarried red sandstone from Indian Creek, about 24 miles southeast of Paris. During winter months, they used wagons to cart the stone across the frozen Bear Lake, cutting several miles from the journey. The Paris Tabernacle seats 3,000 people and is designed to give every person a clear view of the pulpit. To achieve this, Young included a sloping floor, a second-floor gallery, and a semicircular choir loft. Stories about the tabernacle suggest that the roof was designed with shipbuilding techniques, but Young used the typical architectural techniques of the time. President George Q. Cannon, a member of the First Presidency, dedicated the tabernacle in 1889. At that time, it was known as the Bear Lake Tabernacle. Since then, the electrical and heating and air systems have been modernized while preserving the building’s 1880s appearance. The Paris Tabernacle is listed on the National Register of Historic Places. The Cody Mural Chapel, located in Cody, Wyoming, features a large domed ceiling with a mural depicting the early history of The Church of Jesus Christ of Latter-day Saints. The mural illustrates the beginnings of the Restoration of the gospel of Jesus Christ and the dedication of early Latter-day Saint pioneers. The chapel and visitors’ center are open to the public during the summer months, with historical artifacts on display and interactive kiosks explaining the story of the pioneers. Visitors can take free guided tours. The Cody Mural Chapel is ADA accessible, and public restrooms are available. For more information about visiting the Cody Mural Chapel, click or tap here. Latter-day Saints in the Cody area worked with Church leaders to build this chapel in the 1940s. The Saints in Cody commissioned Edward T. Grigware, a renowned mural painter from Chicago, to paint the mural. Grigware, who was not a Latter-day Saint himself, spent a year researching and understanding the history of the Church, which gave him a respect and love for the early members of the Church. 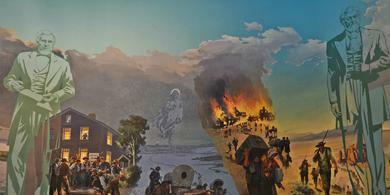 The mural depicts several important scenes in the Restoration, including Joseph Smith receiving the golden plates from which he translated the Book of Mormon, the martyrdom of Joseph and Hyrum Smith, and the pioneers trekking to the Salt Lake Valley and building a temple where they could worship God. Portraits of the first eight Presidents of the Church are interspersed among depictions of these stories. Elder Henry D. Moyle first dedicated the chapel in 1949. Since then, the building has been renovated several times and the original mural preserved. In 1972 Elder Hugh B. Brown rededicated the chapel. For information on other historic locations in Wyoming related to the history of the Church, click or tap here.